During our spring trip to the US Virgin Islands, we spotted the Caribbean, American, European and Asian flare in the clothes people wear, in the architecture and décor of the villas, even in the way people drive. We heard bits of a dozen dialects from around the world in the accents that sing from every corner of the islands. But one of the most delightful ways we were able to tour the world during our island stay was through the delicious meals we shared with each other and with our hosts. The Virgin Islands' colorful history has added more spices to its melting pot of cultures than just about any place on the globe. We arrived on St. John Saturday on a private boat from Peter Island and Tortola in the British Virgin Islands (where we spent the previous week, see our next trip report for details) and had a full afternoon of villa tours culminating in our arrival at our home away from home, Ti Moune (Villa CT MOU). 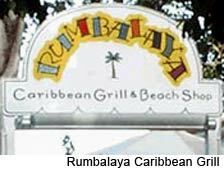 Our villa was just minutes away from Cruz Bay and we opted to have dinner at the lively waterfront hangout Rumbalaya. This was our first chance in the USVI to tuck into local specials such as conch fritters and kallaloo stew. Typical of many restaurants in the USVI, one can chose a thick, juicy American hamburger or go native with grilled tuna seared with guava ginger soy sauce. Local touches include a side of baked plantains in place of French fries and frozen rum drinks served with fresh tropical fruit. After viewing a handful of villas Sunday morning we headed to Coral Bay on St. John’s east coast to enjoy Sunday brunch at Miss Lucy's, one of the best spots on island to sample the local Creole food. Paella, a pot full of seafood, sausage, chicken and saffron rice, is Miss Lucy's special, served with a side of sweet potato stuffing. A little goat wondered from table to table making friends and sampling the handouts. Serenaded by a soft jazz combo, we sat under the sea grape trees and enjoyed the spectacular views of Coral Bay. After brunch, we went to the end of the paved road (way past Coral Bay) and spent some quality beach time on Salt Pond Beach, truly a pristine spot. It's about a 10-minute walk from the road to the water's edge, which is why it's such a secluded spot. Another group enjoying the beach overheard us mention Westport, Mass., and they said "Hey! That’s where we're from!" Small world. Late in the afternoon we drove back to our villa via St. John's fabulous north shore. The lighter turquoise of the shallow water gives way to a deep azure as you look north toward Sir Francis Drake Channel and the scattered green islands of the BVI. 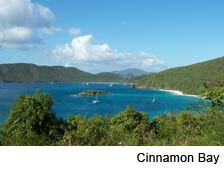 Looking south we could see the steep lush mountains and deep valleys that make up the interior of the Virgin Islands National Park. Laurance Rockefeller donated 5,000 acres of land to the National Park Service in 1956. The park encompasses two thirds of the entire island, guaranteeing miles and miles of undeveloped hills and beaches for generations to come. 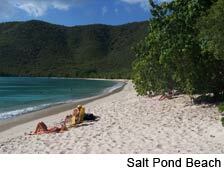 We visited Francis Bay, Maho Bay, Cinnamon Bay, Trunk Bay and Hawksnest Bay before heading home. That evening we joined one of our local reps for dinner at the quaint Chateau Bordeaux, halfway to Coral Bay on Centerline Road near the highest point on the island (1,277 feet). The charming atmosphere and spectacular view compliments the creative French Caribbean cuisine. 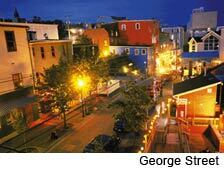 The menu includes Caribbean lobster crepes, pan seared sea scallops buttered with foie gras, and New Zealand rack of lamb. If that’s not exotic enough for you, try the ostrich medallions stuffed with roasted portabella mushrooms, sun-dried cherries and toasted pine nuts served with grilled gorgonzola and a tomato-sherry salsa.